Today marks the beginning of the third year of Bloom Days, in which Carol of May Dreams Gardens in Indianapolis invites her fellow garden bloggers to share what's blooming at their place on the 15th of each month. If blooms outside are still weeks or months away, gardeners are encouraged to get creative and post about their indoor plants, that favorite needlepoint pillow, a floral comforter or quilt ... even silk flowers! 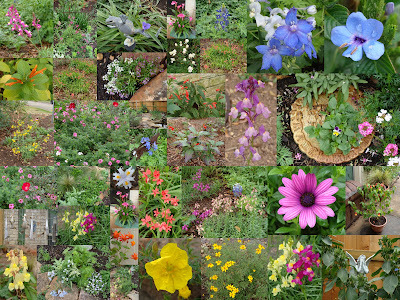 At a time of year when many gardeners are still feeling winter's chill and even their winter blooming snowdrops are shy about making an appearance, I feel very fortunate to have another colorful Garden Bloggers' Bloom Day here on my corner of Katy. This is the first year I've had success with Delphiniums, which took a bit of a pounding from the rain. Purchased as sturdy young plants in 4 inch pots, just barely budding out, they've grown and flourished and are loaded with bountiful blossoms of blue. Perhaps the weather conditions this year were more to their liking or perhaps I placed them in exactly the spot they wanted ... whatever the reason, they look lovely to me despite their sodden condition. I'm learning that Delphs can get a bit top heavy and need staking: here we see my friend Alvaro helping out. This gorgeous blue flower is Eranthemum pulchellum nervosum, sometimes called Blue Sage. Much as I love bluebonnets, if I were allowed only one spring annual, there's no doubt in my mind at all what it would be: Linaria maroccana, Toadflax. This Osteospermum was a rescue from the clearance racks at Lowe's. I've had trouble getting them to grow before so I'm delighted at how happy this one has been where I planted it. I do have other colors besides blues and purples in the gardens. A Crown of Thorns adds a splash of red to a patio. The Calylophus in the corner bed have bloomed nonstop this winter. As I mentioned earlier, plans are in the works for this year's Garden Bloggers Spring Fling, to be held May 29-31 in Chicago. 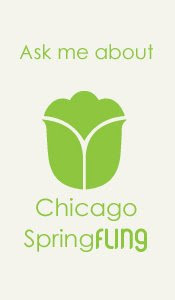 Check out their website at Chicago Spring Fling for detailed information on the schedule of events. In addition to the fantastic gardens I'll get to visit, I'm looking forward to reuniting with some of the wonderful gardeners I met last year, and meeting others for the first time. Many thanks to the organizers who are working so hard to make this an amazing weekend for bloggers from across the country. I love delphiniums and am always trying to get them to bloom in my garden, but haven't had much luck. Yours makes me all envious! Looking forward to seeing you again in Chicago! Beautiful blooms and the presentation is marvelous. Happy GBBD. Cindy, your hard work in the garden is showing! PS: The pink jasmine is worth it! I'm amazed at what you have blooming now. I can't get over that bluebonnet - it's so early! Your garden looks like it's at peak bloom. How refreshing to see Delphiniums and Coreopsis in full bloom. Is that a pink Calla Lily? Wow! Many here have great success with delphs here, but mine has been spotty. I like the little pig (bull?) sculpture a lot. You've got some great blooms in your garden. It was really nice meeting you at the Garden Design class. Hope to see you again soon. Gorgeous! I love the blue of the delphiniums. I've tried them a couple times here, but the slugs always manage to take them out in one night. Maybe I'll try it again one of these days. I'll just have to plan more vigilant slug patrols! I like your flying (dancing?) frog too! Gail, the collage is a Picasa trick. I downloaded their photo editing software and have found it very useful. And fun! Carol, I trust you will wear your SGAFO pin to Fling? Dee, your collage was beautiful! Lisa, thanks for stopping by! I hope to meet you at Fling. Nancy, I'll have to see where I can fit/shoehorn a pink jasmine! Jean, I think the confinchion is winding down here. There weren't many at the feeders yesterday. MMD, isn't that pink Calla Lily something? The color is very intense. EAL, the sculpture is a flying pig. His name is Alvaro because I was listening to Lyle Lovett's Road to Ensenada a lot at the time I bought the sculpture. The title song has the words "adios to Alvaro" and the name just seemed to fit. Cheryl & Randy, I hope I can join y'all for some nursery hopping in Austin sometime! Dreamy, the frog is part of a hose guide from Smith & Hawken ... isn't he a cutie? Leslie, I'll do my best to remember to save you some seeds for Linaria. I can't imagine spring in my garden without them! MT, I'll do my best to chronicle spring's progress in the garden!